DO or DIE: Affect, Ritual, Resistance serves as one artist’s action in opposition to these overwhelming societal forces, seeking instead to elevate and re-contextualize Black life and death. Through performance, painting, drawing and video Pecou reframes our view, incorporating references from Yoruba/ Ifa ritual to cultural retentions of hip-hop to the philosophy of Négritude, and through this shapes a story that seeks to affirm life via an understanding of the balance between life and death. “Most young kings get their head cut off” – Jean Michel Basquiat. These words, both warning and lament, eerily presage the state of existence for Black men today. Our media landscape is inundated with the faces of Black boys and men alongside captions that detail their often violent and untimely deaths – often at the hands of those sworn to protect and serve them. Other times it is violence turned inward plaguing Black communities with death by our own hands. These images have become a ubiquitous sight, a spectacle of Black Death. Though not new, the velocity of these harrowing images has increased dramatically in the last 3 years. By August 2016, as I write this, the spectacle has become almost commonplace. Violence as it relates to Black bodies is endemic. Long used to strip Black people from having any agency, the threat of destruction (physical, social, economic, spiritual) has historically worked to contain and dehumanize Black bodies. From the Trans-Atlantic Slave trade to Jim Crow to the era of mass incarceration, Black men’s bodies (in particular) have maintained a peculiar proximity to the threat of death. This spectacle of death remains a visceral inevitability instilling fear and panic, but perhaps worst of all despair. In what ways could we combat this spectacle? Under the looming threat of death, how might we inspire life? Through what mechanisms could we resist the psychological violence and despair inspired by the threat of violence and usher in hope? My exhibition, DO or DIE: Affect, Ritual, Resistance, considers the affective power of art as a space of resistance. These works examine and incorporate the power of creative expression and ritual – particularly, those found in Yoruba/Ifa spirituality – interpreted through various art mediums. 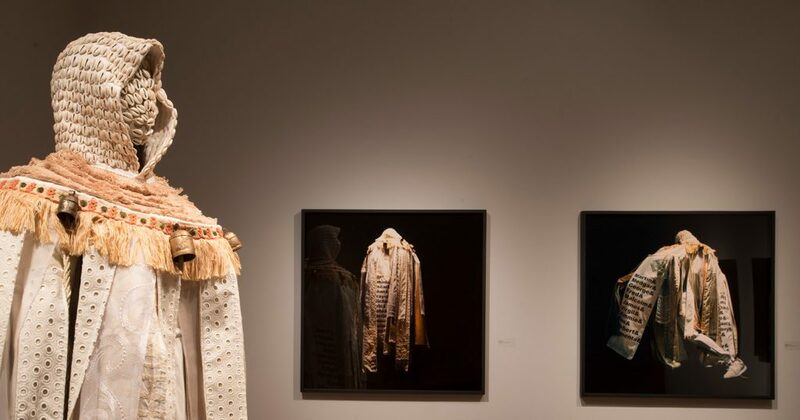 Thinking through the ways in which a history of violence and dehumanization against Black people has worked to dis-member the Black body, this exhibition attempts to re-frame concepts of Black life and death. Through this body of work, I perform an elevation ritual for the spirits of the countless Black men whose deaths linger as haunting reminders of the destruction that threatens Black bodies. By elevating these spirits I help to restore balance and healing in the Black community and beyond. In many indigenous cultures, like that of the Yoruba of West Africa, the performance of certain rituals marks the point of death as a period of transition rather than an end. By invoking Yoruba theology and philosophy, I propose to reframe the way death is viewed and understood. These traditional systems embrace the transition through ritual, performance, song, dance, orature, and images and as such become empowered by it. 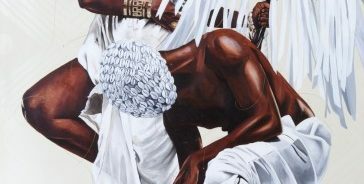 In Ifa, many rituals and celebrations, as well as daily activities require the veneration and honoring of ancestors (deceased loved ones and community leaders who continue to commune with the living from the spiritual realm). The bond between the spirit and living worlds requires balance. Ritualized customs and traditions help maintain this balance. Some of these traditional customs remain a part of our modern practices through cultural retentions (but often go unrecognized as such). Within my work, I comment on these retentions where they appear in aspects of hip-hop and other Black customs and aesthetic practices. In my work, hip-hop (body), Négritude (mind) and Ifa (spirit) combine to tell the story of a spirit’s journey and offer a proposal for holistic rejuvenation. DO or DIE is not a story of death, but one of life. The images in this series depict a male spirit as he journeys theall or àjé. Here he encounters Odù the mother with a womb filled with gods (Washington, Teresa W., “The Architects of Existence: Àjé in Yoruba Cosmology, Ontology, and Orature”, 21). In these works both death and life exist as liminal rather than finite spaces. Considering that the visuality of Black Death empowers the threat, creative expression as resistance becomes even more significant. Art is a powerful vehicle. As such, the various images in this exhibit operate as a campaign of resistance. Rather than depict or fetishize the violence that proposes our eradication, this exhibit focuses on representations that affirm cyclic infinitude of our spirit. DO or DIE is a different type of spectacle, one that distances itself from the terror and violence typically associated with Black bodies. It affirms life and life beyond. It reclaims what was lost, turning our gaze inward and ultimately forward. Through ritual, performance and image, the exhibit challenges the perception of death’s dominion. Ultimately, DO or DIE is a reminder of an intimate balance that affirms life. It is art as affective resistance. It is a healing. Pecou’s work is featured in noted private and public national and international collections including; Smithsonian National Museum of African American History and Culture, Societe Generale (Paris), Nasher Museum at Duke University, The High Museum of Art, Paul R. Jones Collection, Clark Atlanta University Art Collection and Museum of Contemporary Art Georgia. DO or DIE: Affect, Ritual, Resistance is organized by the Halsey Institute of Contemporary Art, College of Charleston School of the Arts in collaboration with the Michael C. Carlos Museum of Emory University. PLEASE BE AWARE: This film contains strong language that may not be suitable for all.